We wrote earlier this week about Republican gubernatorial candidates who reacted with over-the-top anger to Gov. John Hickenlooper’s decision to join the U.S. Climate Alliance–a group of states committed to meeting the goals of the Paris Climate Accords despite President Donald Trump’s unilateral pullout of the United States. We don’t know who Mark Train is, but we assume he doesn’t drive an electric car! Bah-dum-tish! Ribbing aside, this is another chance to remind readers that we’ve never understood the intensity of the clamor against renewable energy from groups like the Independence Institute and their Republican message surrogates. The scientific consensus regarding human-caused climate change is really only challenged by a small subset of non-mainstream voices, who are almost always are revealed under scrutiny to be funded by interests with a financial motive to deny the overwhelming consensus. This description sums up the Independence Institute pretty well. 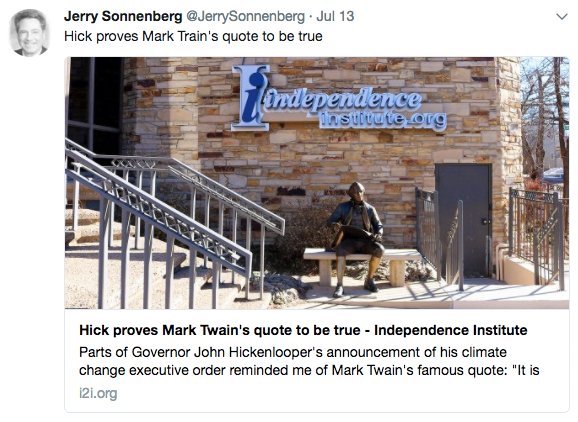 What we’re trying to say here is that the only people who rage against renewable energy this much are paid to–or in the case of politicians like Sen. Jerry Sonnenberg, supported politically by those who are. If you don’t have a financial interest in the fight against clean energy, there’s just no reason to badmouth it. Not even as price-sensitive consumers, since the cost of power from renewable sources has been dropping, steadily eroding that once-decisive factor. Consumers understand the benefit of using clean energy over fossil fuels, and are excited about new technologies to make them practical. In all cases, whether it’s the GOP’s candidates for governor or the fossil fuel industry’s paid surrogates, these are extremely weak arguments, that the next generation will find laughable as they routinely set out for the West Coast in their electric cars and power their homes with renewable generation. Unless you’re already primed for these anti-renewable energy arguments by immersion in the Fox News/talk radio infobubble, in which case you’re the choir the Independence Institute is wasting time preaching to, it simply doesn’t work. It sounds stale, strained, and above all contrived. If the free market is solving the problem why do we need mandates? It doesn't make sense and your whole case falls apart. Let's go back to 2004 when Sonnenberg and his little sidekick opposed every renewable piece of legislation to pass our legislature? You know, that set of policies that's brought some $6 billion in investments to Sonnenberg's district? All opposed by him? The free market 'spoke' in Colorado – through its elected representatives who controlled the legislature. Still waiting for you to explain how ACA repeal will benefit Americans, Moldy. Oil and Gas has been on a gravy train of subsidies since the 1920's. Isn't about time that we stopped propping up these destructive industries. Time for them to compete with clean energy with government's thumb on the scale. Offer people the choice between cleaner air and water or dying of cancer and a destroyed environment. If oil and gas paid for the commons that they are destroying then the cost would truly reflect what is at stake. A free market can only exist if politicians stop feeding the beast of inefficient and destructive energy. Stop Oil and Gas subsidies Moldy. Surely that is in your free market wheelhouse.